GUILDFORD, Surrey, United Kingdom, April 30, 2018 (EcologyPrime.com News) – The first in-space test of technologies to clean up the thousands of pieces of space junk orbiting the Earth was launched on April 2 from the Kennedy Space Center in Florida to the International Space Station. Hopeful scientists on Earth are following the RemoveDebris mission designed and manufactured by a consortium of space companies led by the University of Surrey and funded by the European Commission. A SpaceX Falcon 9 rocket propelled and delivered the RemoveDebris satellite to the International Space Station, where it arrived on April 4. From the ISS, it will be deployed to conduct a series of experiments to demonstrate cost effective technologies, such as a net and a harpoon, that can be used to capture space debris. RemoveDebris is not an end-to-end demonstration of a full Active Debris Removal (ADR) mission but a research project to develop and fly a low cost in-orbit demonstrator mission to de-risk and verify rendezvous, capture and deorbiting technologies needed for future ADR missions. 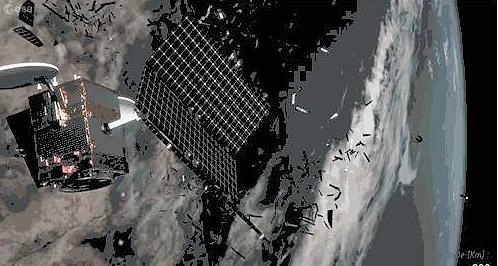 A microsatellite called RemoveSAT will release, capture and deorbit two space debris targets, called DebrisSats. In the first of two capture experiments, a net will be discharged at one of the deployed target cubesats to demonstrate net capture in space. The second capture experiment will see a harpoon launched at a deployable target plate, made of representative satellite panel materials – the first harpoon capture in orbit. The third experiment involves vision-based navigation by deploying the second cubesat and demonstrating rendezvous navigation using cameras and a LiDaR. Finally, the RemoveDebris spacecraft will deploy a large dragsail to speed de-orbit, where it will burn up as it enters Earth’s atmosphere. The ultimate goal of this research is to protect space assets from space debris and to minimize the collision risk for current and future space missions. Professor Guglielmo Aglietti, director of the Surrey Space Centre at the University of Surrey, said, “It is important to remember that a few significant collisions have already happened. Therefore, to maintain the safety of current and future space assets, the issue of the control and reduction of the space debris has to be addressed. “We believe the technologies we will be demonstrating with RemoveDebris could provide feasible answers to the space junk problem – answers that could be used on future space missions in the very near future,” said Aglietti. Today’s active satellite infrastructure includes telecom, weather, navigation, broadcast and climate-monitoring missions, which provide a multitude of critical services and daily benefits to citizens and economies. Their loss, if their orbits are polluted by debris, would severely damage modern society, space experts warn. There was broad international agreement that the continuing growth in space debris poses an urgent threat to economically and scientifically vital orbital regions among experts at the 7th European Conference on Space Debris at the European Space Agency’s mission control center in Darmstadt, Germany, held in April 2017. “Fast and reliable implementation of mitigation measures for all missions and a change in the operational paradigm to consider space-object disposal as an important part of the overall mission are essential to contain the growth of the space debris population and to preserve space for future generations,” said Holger Krag, head of ESA’s Space Debris Office and conference chair. Since 1957 when the Soviet Union launched the first satellite, more than 5,250 space launches have led to an on-orbit population today of more than 23,000 tracked debris objects. Only about 1,200 are functional spacecraft. The remaining are classified as space debris and no longer serve any useful purpose. A large percentage of the routinely tracked objects are fragments from the 290 breakups, explosions and collisions of satellites or rocket bodies that are known to have happened. 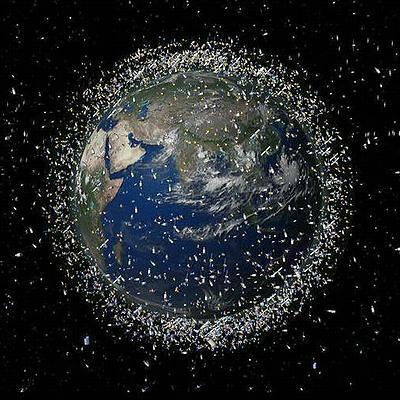 The United States is responsible for the most debris in space, followed by Russia and China. The United States’ Space Surveillance Network consists of U.S. Army, Navy and Air Force-operated, ground-based radars and optical sensors at 25 sites worldwide. The SSN tracks about 8,000 man-made space objects, baseball-size and larger, orbiting Earth. The objects are active and inactive satellites, spent rocket bodies, or fragments. About seven percent are operational satellites, 15 percent are rocket bodies, and about 78 percent are fragments and inactive satellites. “We see evidence that fewer than half of the satellites that should be deorbited at end of life are actually commanded to do so, and there is no enforceable international regime to ensure this,” said Dr. Krag. An estimated 750,000 objects larger than one centimeter and a staggering 166 million objects larger than one millimeter are estimated to be circling the planet in commercially and scientifically valuable Earth orbits. In low Earth orbit, objects travel at seven kilometers (four miles) per second. At that speed, a tiny paint chip can be compared to the impact of a 550 pound object traveling at 60 miles per hour. “It’s the classic tragedy of the commons, except it’s happening in space and could ruin modern technological society for everyone,” warned Dr. Krag. That’s why this first in-space test of cleanup technologies is so important. Once released from the International Space Station and flying freely, the RemoveDebris mothership will practice hitting one of three onboard targets called CubeSats with a harpoon. The harpoon concept for large debris items was developed on the ground by an internal Airbus R&D team and a small scale demonstrator will be flight tested on RemoveDebris. 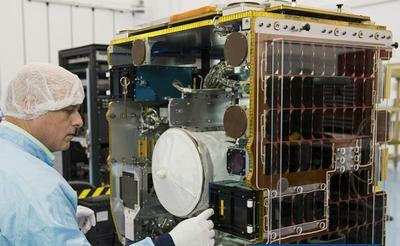 Another CubeSat will be released for recapture with a net. As the simulated debris CubeSat drifts away and reaches a specified distance from the main platform, a net will be released to capture it. Once the net is ejected, it will expand in size and throw weights at the edges of the net, which will wind the net closed after it has captured the target. These events will be recorded by on board cameras from the main platform and be downlinked to personnel the ground. For a detailed description of these technologies, visit: the European Space Agency site here. “The UK Space Agency continues to work closely with industry to develop new technologies and infrastructure to grow our share of the global space market as part of our modern Industrial Strategy,” Gyimah said. RemoveDebris is a low-cost mission funded jointly by the European Commission and 10 partners from France, Netherlands, Switzerland, South Africa and the UK. The partners are: Airbus, the world’s second largest space company; Ariane Group (France); Surrey Satellite Technology Ltd, the world leader in small satellites (UK); Innovative Solutions In Space (Netherlands); CSEM (Switzerland); Inria (France); and Stellenbosch University (South Africa). Leading the consortium is the Surrey Space Centre at the University of Surrey, a world-leading research center since 1979 for small, cost-effective space missions. The university prides itself on training the next generation space scientists, engineers, entrepreneurs and business leaders. © 2018 Ecology Prime Media, Inc. All rights reserved.